I had to try out this deviled egg recipe I found in the Real Simple May magazine issue. They had variations listed with wasabi, crab, and jalapeno options. I love mexican style foods so I decided to give the cumin and jalapeno ones a try. They were really quite tasty. 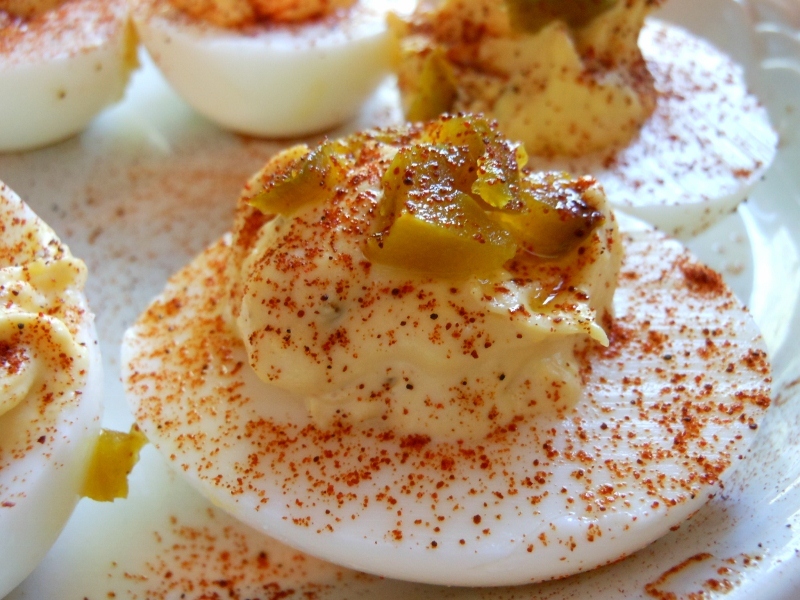 I can’t say I would want them every time I make deviled eggs; but for a great dish to go along with something on the southwestern side these would be perfect. I made a few subtle changes to the recipe; here’s my version. Hard cook eggs as desired. I like to cover mine with cool water; bring to boil over medium high heat and reduce to a very low simmer for 15 minutes. Cool thoroughly. Peel eggs, slice in half, and remove yolk. In small bowl combine egg yolk, mayonnaise, Dijon mustard, lemon juice, pepper, and cumin. Spoon mixture back into egg whites and sprinkle with diced jalapeno and chipotle pepper. Refrigerate until ready to serve.